We’ve become a sound bite society. 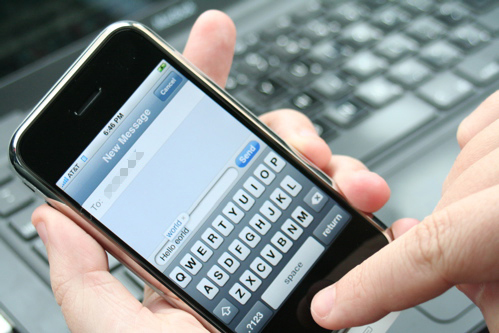 News, entertainment, sports, and politics, all delivered in thirty and sixty-second bursts. No wonder tweets and text messages have taken over the world. We’re learning on the fly and drawing conclusions in milliseconds. Unfortunately. When you subtract the smiles, the tone of voice, and the twinkle in someone’s eye, you risk missing the heart of the message. And you may miss an amazing story. I was invited to a Miami Heat game last season and jumped at the chance to sit in a corporate box and watch LeBron, D-Wade and company. I said yes, without even asking the who. I knew the what, the where, and the when. That was all that was important. Or so I thought. My host, Jim Nolan, said that we’d be joined by another guest: Alex Sink. Jim told me with such enthusiasm and heartfelt support for Alex that I didn’t dare tell him how I really felt. 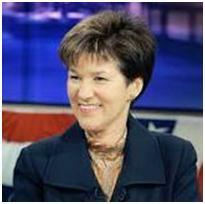 Alex had been the Democratic candidate for Florida governor in the 2010 election. A politician. Strike One. She was formerly the President of Bank of America in Florida. A banker. Strike two. I knew that if she proved to be a phony or started asking favors, I’d have a tough time keeping my mouth shut – and Jim would suffer the collateral damage. But I didn’t want to miss the game. Note: A brief explanation: Politicians – Most of what we see of politicians are short clips of them on commercials produced by their opponents. No one comes across well. Bankers – I spent ten years in commercial banking and now have a short fuse when it comes to bankspeak. I know some great bankers, but my first reaction with strangers in banking is to go cynical. It’s my issue, I know. Alex suddenly whipped around in the seat with the enthusiasm of a little kid, and an expectant look on her face. Uh-oh. She had asked me a question. I missed it. “Excuse me?” I tried not to grimace as I waited for her to ask my opinion of the direction of the Florida economy or my grade for Governor Scott’s performance so far. She might as well have said space aliens just landed on Biscayne Boulevard. “What?” I leaned forward. For the rest of the ride, and during the walk from the parking lot to the Arena, we talked about quarterbacks, the plight of the Dolphins and the Buccaneers, and Peyton Manning’s recovery from shoulder surgery. Alex was funny, passionate about sports, and she was an equal opportunity grief-giver to Jim and me. I was trying very hard not to like her. It was tough. We exchanged pleasantries with other attendees when we arrived at the box (including the evening’s host, Miami architect Steve Tewes), and continued to stand as the game started. 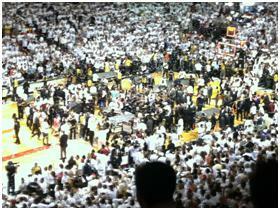 The Heat fans around us were vocal, and Lebron and D-Wade did not disappoint in the first quarter. But the Hawks refused to go away. We watched the point guard for the Hawks blow past two defenders at half-court and launch a three point shot. Nothing but net. A collective groan came from the box. But right next to me I heard a YESSS! I turned to see Alex with both fists over her head. She’s wasn’t playing the game. She wasn’t stockpiling political capital with the home crowd. She was being genuine. Awesome. Over the next two hours we talked about Wake Forest, the NBA, Stanford football (her son and Jim’s son played on the Stanford team together), wedding plans for her daughter, and some of her own background. She shared that she grew up in Mt. Airy, North Carolina, the home of Andy Griffith and the model for the town of Mayberry. She taught mathematics for three years in Western Africa. 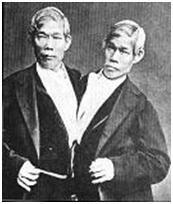 Her great grandfather was Chang Bunker, one of the conjoined twins responsible for the creation of the term “Siamese twins.” I was alternately fascinated, impressed, and entertained. We also talked business. Alex is now a Senior Advisor at Hyde Park Capital, a Florida-based investment banking firm. She is also the founder and Chairperson of Florida Next, a non-profit think tank designed to drive entrepreneurialism and innovation in Florida. Even the business discussion was right up my alley. It wound up being a wonderful evening. And the shoe that I kept waiting to drop never did. At least not that night. Several weeks later, I received a phone call from Alex. OK, here we go. A fundraising strong-arm? A request for an introduction? “What is it?” I asked, already preparing my tactful decline. Three days later I met Juan Pinzon and he shared his story. I’ll describe Juan in greater detail in a future blog post, but the kid knocked my socks off. His parents emigrated from Colombia, and have raised three great kids. Juan is bright. Driven. Principled. Both a dreamer AND a doer. He’s wanted to be a Marine since he was twelve years old. If our military is attracting leaders like Juan – our future is in good hands. I know he would have been confused if I’d verbalized it, but I walked away from our meeting, thinking, “I want to grow up and be like him” – even though he’s thirty years younger than me. I sent Alex an email letting her know about the meeting and said I’d make an effort to help. I contacted a friend, who contacted a friend, who interviewed Juan, and he now works at one of the fastest growing technology companies in the state of Florida. I’ve seen Alex several times since then, and we greet each other like old friends. I long ago quit waiting for the other shoe to drop. I don’t worry about what she needs from me. She thinks I did a favor for a friend of hers and says “I owe you one.” But I know the truth. She told me fascinating stories about her own life that have inspired me. She introduced me to someone who reminds me that we live in a great country, and that our youth are capable of extraordinary things. Alex and Juan have both reminded me that picking up the phone to help someone? That’s what friends do. Not that I’m keeping score, but I owe Alex. Big time. Don’t paint all public figures with the same brush. There are some you’d like to ship off to a deserted island. But there are some cool people out there, with big hearts and interesting stories. Don’t allow sound bites to define someone; there may be a lot of depth you’ll never get in a thirty-second clip. Draw conclusions … for the right reasons. Everyone has a story. Don’t shy away from the conversation. Pull up a seat. Ask a question or two. You’ll be amazed at the stories you’ll hear. Great stories aren’t reserved for people who have had long lives or varied careers. That kid sitting next to you at Panera Bread or standing behind the counter at Starbucks may have the story that breaks your heart… or truly inspires you. If you need some advice on asking people to tell their story, please see the earlier post, “Everyone Has a Story,” and learn Boaz Rauchwerger’s “Five Questions.” They work. A great story, Karl. My experience with Alex has been the same as yours. She is a genuinely caring individual who acts with great purpose. Her non-profit, Florida Next, is all about supporting businesses and job growth in our state. I support her efforts. I also voted for her when she ran for governor. So, perhaps I have a bit of a bias. discovering better products, to sustain with this competitive field. and installation and the renowned brand equity available from Microsoft.